News of a Myiarchus flycatcher in Bonavista surfaced yesterday (October 31), when local birder Jon Joy sent photos of an odd flycatcher that had been frequenting his yard since the day before. While any of those species would be very rare in Newfoundland, the date immediately suggested that Ash-throated Flycatcher (Myiarchus cinerascens) must be considered. Although this species breeds only as close as the southwestern United States, it is well-known for its habit of wandering far afield during fall migration, sometimes well out of its normal range. 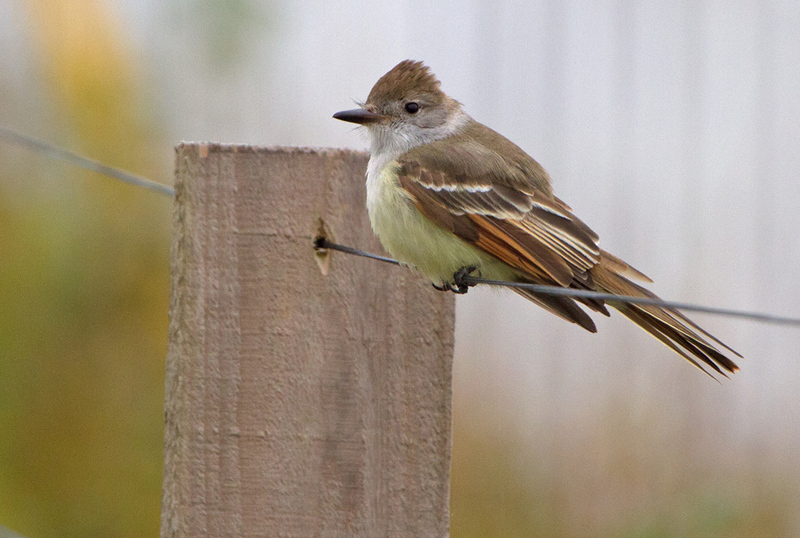 After consulting some out-of-province birders with more experience separating this species from the more regular Great-crested Flycatcher (which itself is only recorded in Newfoundland every few years), the bird was deemed a “slam-dunk Ash-throated” – just the second record for the province!! This striking Ash-throated Flycatcher was discovered at Bonavista on October 29, marking just the second record of the southwestern species for the province. It was an exciting find, and so far has hung around for at least a few birders to make the trek. Three St. John’s birder made the 3+ hour trek early this morning, arriving in Bonavista around sunrise and soon (much to their relief) found the bird hanging out around the same house – often hiding in some raspberry plants at the back of the property. And with that, the number of Newfoundland birders who can claim Ash-throated Flycatcher for their provincial list had doubled. More birders will make the trip tomorrow, hoping the bird is planning to stick around for at least one more day. It was November 14, 2009. Dave Brown, Chris Ryan and I had been birding some small communities and generally under-birded spots along the Avalon’s east coast – a late fall tradition I started a few years earlier and dubbed the “off-the-beaten-track tour”. We were already having a good morning, having found a Dickcissel, Indigo Bunting, Orange-crowned Warbler, a few late shorebirds and (most recently) a bright Pine Warbler. It was about 11:00am as we rolled into the “pig farm delta” area of Trepassey and spread out to look for birds. Suddenly, I heard Dave shout something from the top of a long driveway which leads to a house and feeder we always check. It took a second for the words to sink in and make sense, but then it struck me. “ASH-THROATED FLYCATCHER! !” I ran as fast as my clunky rubber boots would carry me, making it there just in time to see a drab Myiarchus flycatcher drop down from a treetop. We scanned the area for several minutes, but the bird never popped up again. By now Chris had caught up to us, and we decided to start searching nearby properties. Amazingly, Chris managed to reach another team of birders that had been birding Cape Race, a good hour south of us (where cell phone coverage is notoriously patchy). We could almost hear their tires screeching as they sped north. 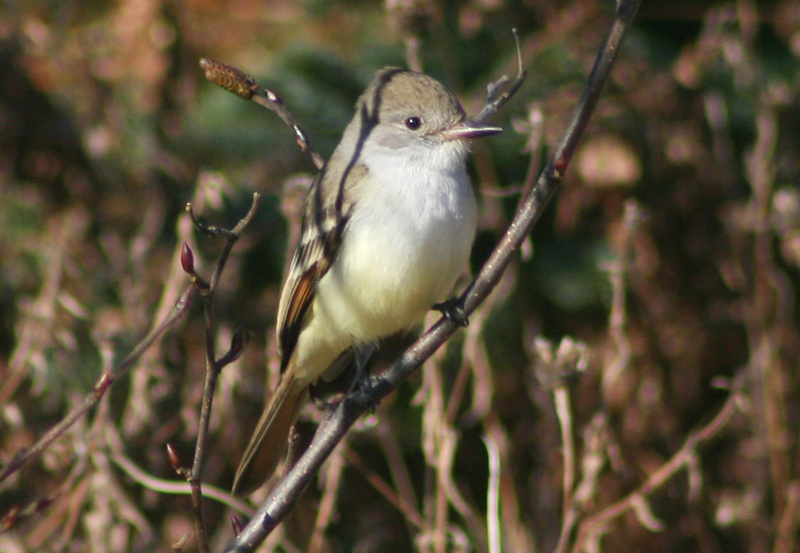 This Ash-throated Flycatcher, photographed in Ferryland on November 14, 2009, was the first record for Newfoundland. However, it was far less cooperative and only stayed for a matter of minutes after first being spotted. We immediately got permission to search a neighbouring property (and some quizzical looks as we explained what we were looking for!). After a few minutes poking around, I rounded the back of a woodshed to find Dave and Chris staring intently at some bushes just yards away. There, sitting eye-level and quite contentedly, was the bird. After studying it through my binoculars for a few short moments, I was able to get some mediocre but very important photos. Then the bird flew up to a nearby conifer, sat for another minute or so, and darted around the corner of the house. We decided as a group not to try for better looks or more photographs, so as not to scare it off. I managed to spot the bird momentarily further down the driveway and tried to keep an eye on it from a distance, but it eventually flew down and disappeared. The other team of birders arrived twenty minutes later, and still more over the next hour or so – but the bird itself was never refound. A painful moment for some, since Ash-throated Flycatcher had been a long-awaited addition to the Newfoundland checklist. Hopefully the Bonavista bird is a bit more confiding and can heal a few more wounds from that November day. Me?? I’m just happy I don’t have to make that 3+ hour trek in order to find out!! This entry was posted in Uncategorized and tagged ash throated flycatcher, Bonavista, Myiarchus cinerascens, Newfoundland, rare bird. Bookmark the permalink.